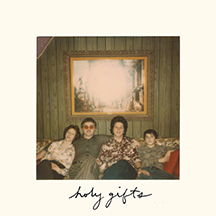 The first self titled EP released by Holy Gifts is a product of 7 years of work. Recorded between October 2017 to July 2018 in New Jersey and Baltimore, this first release is a short example of the scope of the band as a singular entity. Using basic rock trio formations, textural synths and subtle additional sound, the 6 songs of this release range topically from religious contemplation ("Plastic Mary") to the beauty of loss ("Everything").